Nereus Director of Science William Cheung was a plenary speaker at the ‘International Conference on Scenarios and Models of Biodiversity and Ecosystem Services in Support of Decision Making‘. He discussed the linking of models and scenarios for marine biodiversity and ecosystems to support policies at regional to global scales. 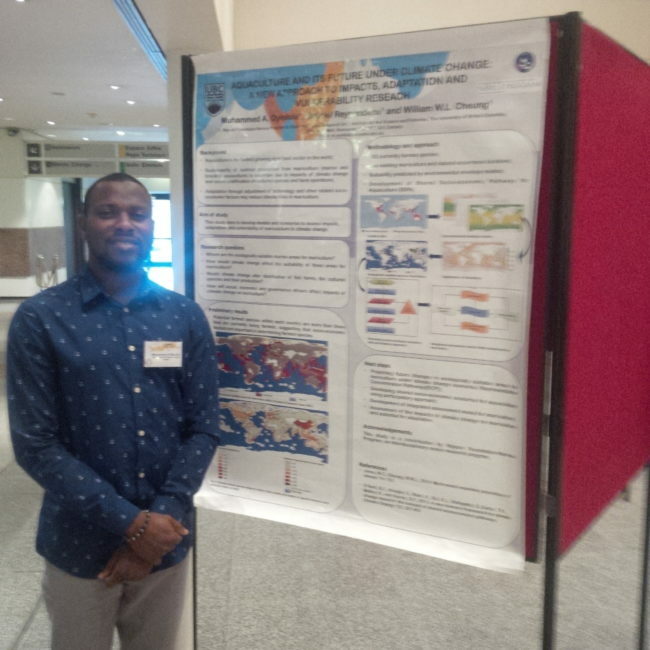 Nereus Fellow at UBC Muhammed Oyinlola presented a poster on his project on developing models and scenarios for the future of global mariculture under global change. 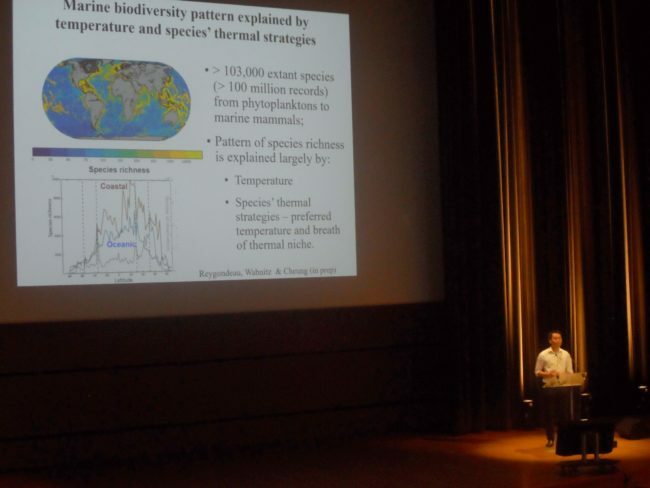 The conference took place from August 24 to 26 in Montpellier, France, and was organized by the Biodiversity and Ecosystem Scenarios Network (ScenNet). It brought together a diverse group of participants who work on topics from terrestrial to marine realms. William Cheung, in his plenary talk, discusses the important applications of models and scenarios for regional and global decisions for the oceans. In his talk, Cheung discussed three important applications of models and scenarios for regional and global decisions for the oceans. He talked about the identification of thresholds and trade-offs, assessing co-benefits, and developing pathways to achieve multiple sustainable development objectives. 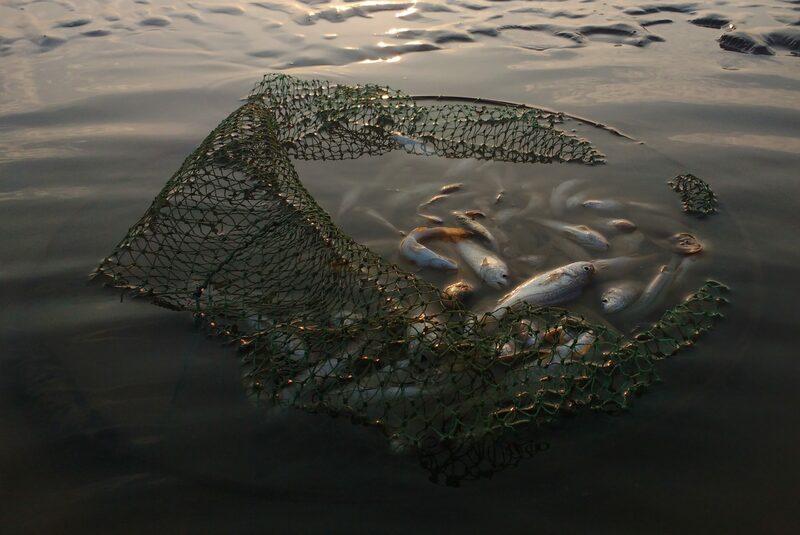 He drew on three illustrative examples from Nereus Program research – the thresholds and trade-offs of climate change, biodiversity, and fisheries in the Paris Agreement, research on the management of ecosystem services in areas beyond national jurisdiction and climate risk reduction (co-benefits), and South China Sea research looking at pathways to achieve multiple sustainable development objectives. Muhammed Oyinlola presents his poster on the future of global mariculture under global change. During the conference, the Summary for Policy Makers for the IPBES Methodological Assessment of Scenarios and Models of Biodiversity and Ecosystem Services was launched. William Cheung is one of the Coordinating Lead Authors. The assessment focuses on a critical analyses of the best practices for using scenarios and models in assessments and policy design and the implementation relevant to biodiversity and ecosystem services. It proposes means for addressing gaps in data, knowledge, methods and tools relating to scenarios and models. It makes a series of recommendations for action by IPBES member states, stakeholders and the scientific community to implement and encourage these best practices in regards to the use of scenarios and models, to engage in capacity building, and to mobilize indigenous and local knowledge.